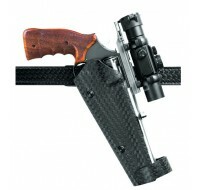 Includes all the features of the WSM Speed holster above. Short fits 4" to 5" barrels, Long fits 5" .. The Cup Challenge Competition Holster features dual tension screws on the holster body, one in back ..
All the great Safariland competition features in a holster designed specifically for revolvers with ..